Noxian refugees from the Void War fled to the Ionian island of Shon-Xan, triggering a dispute in the League of Legends. Ionia ultimately prevailed. The dispute began on 24 November, 23 CLE, and ended on 28 March, 24 CLE. For a succinct summary of the previous three arcs, visit Previous Storylines. 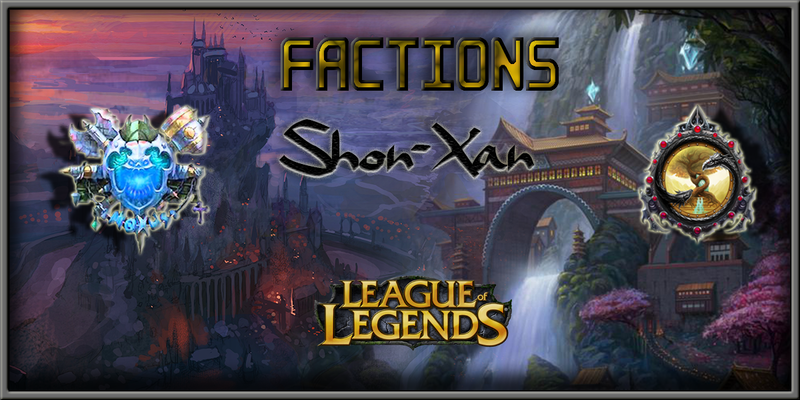 For a more narrative overview of the Factions saga to date, including Shon-Xan, visit Storyline. The “scoreboard” showing changes in the balance of power between Noxus and Ionia arising from match outcomes. The Void War devastated Runeterra and culminated in a pitched battle at the gates of Noxus. Though the Void was driven back to Icathia, much Noxian land is now uninhabitable, contaminated with deadly magic and haunted by terrors from beyond. Over one hundred thousand Noxian refugees have fled their polluted lands in search of new homes. A large contingent of refugees sailed to the Ionian island of Shon-Xan and set up a settlement in the wilderness, invoking the Council’s humanitarian laws for protection. Ionia swiftly protested, calling this a new Noxian invasion, and mobilized its navy. A battle ensued, and the Noxian fleet was victorious. Ionia prepared to mount a land defense. Realizing that battle would likely destroy the port, both sides agreed to League arbitration. Ionia was victorious, and the remainder of the Noxian refugee fleet was forced to depart, leaving only a small and ill-supplied settlement. Resisting Irelia’s demands that Ionia deploy its army to wipe out the settlement, Karma ordered Ionia’s standing military to respect the Council’s ruling that the settlement was protected by humanitarian refugee law. Nonetheless, it appeared that soon Ionia would have won a League decision ordering the refugees to leave. As Noxus stood at the brink of defeat, its cunning Grand General set in motion a nefarious strategem. 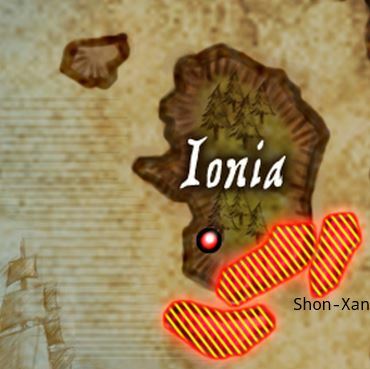 Ninja assassins from Zed’s Order of the Shadow killed several key Ionian military and civilian leaders, and Ionia fell into panic. Karma accused Noxus of collusion with Zed and mobilized the Ionian military to remove the Noxian settlers, declaring that their actions had waived their humanitarian immunity. Anticipating a Noxian counterstrike, Ionia deployed its forces to reinforce the ports, but Noxian troops bypassed the blockade with Zaunite war-zeppelins. Several elite Noxian legions airdropped into Ionian territory and drew battle lines around the settlement. In a final effort to avoid full-scale war, Karma convinced the Council to convene a second tournament. If Ionia prevailed, Noxus would be forced to withdraw under threat of Council intervention. If Noxus were victorious, open warfare would surely erupt. After a hard-fought battle, Noxus won. War raged through Shon-Xan. Elite Noxian shock troops devastated the still-disarrayed Ionian military and established a foothold as they awaited reinforcements by sea. However, Demacia intervened, obliterating the Noxian fleet (which sailed with a massive complement of army regulars and armed refugees) and deploying Demacian troops to take back Shon-Xan. The tides turned. Meanwhile, Ionia won several important victories in the League of Legends. Eventually, Ionian diplomats were able to convince the Council to issue an edict that all fighting cease by sunset on March 28. In one final day of bloody combat, Noxus and Ionia each sought to secure what objectives they could before the League intervened. Ionia ran down and destroyed the remnants of the Noxian legions that had wrought so much havoc during the counteroffensive. Through the deployment of terrifying Zaunite biochemical weaponry, Noxus was able to keep the flag flying over the settlement’s walls when the sun set, though many Noxian soldiers and civilians within also succumbed, and the land around the settlement was ruined. Ionia has destroyed the Noxian war machine, now in shambles and no longer a threat to the nations of Valoran. Though Noxian forces have been driven from Ionia’s shores once again, the League has recognized the refugees’ ownership over a small patch of blighted land on which stands the hungry and battle-ravaged settlement. The rightmost island is Shon-Xan, one of the three (highlighted) provinces in dispute in the Noxus versus Ionia conflict concluded a few years ago. The combined might of Runeterra stopped the legions of the Void at the gates of Noxus, but at great cost. Much Noxian land is now uninhabitable, poisoned by magic and haunted by demons from beyond. Over one hundred thousand Noxian refugees have fled their homes. The arrival of Noxian refugees in Ionia has sparked a new dispute in the League of Legends. Riven fights to protect a small Noxian refugee settlement in the Ionian wilderness. Udyr joins the fight to drive out the Noxian invaders. With the Noxian fleet within striking distance of the port of Shon-Xan, the Council announces a tournament to resolve ownership of the port without risking its destruction in battle. Noxian Champions take advantage of the brief lull in League matches following the tournament to shore up the settlement’s defenses. The story of Irelia’s ascension to Champion in the first bloody Ionia–Noxus conflict, and an argument with Karma as to Ionia’s peace-seeking strategy. On the brink of defeat, Grand General Swain sets in motion a nefarious scheme. An Urgent Dispatch from the League! An informal update preceding the second tournament. Noxus launches a sneak attack on Ionia. After Noxus strikes back and wins the tournament, Ionia turns to its ally, Demacia. For information on Ceruleana, see the opener for Discord — and, of course, the Ceruleana arc. A new Champion joins Ionia’s cause. The winner of a Featured Match has a 20% chance of a new Champion, and an 80% chance of bonus points. Ionia prevailed in the March 9 Featured Matches, and for the first time this storyline the result was the addition of a new Champion. Another look at the last day of the Shon-Xan conflict, from another perspective. The story continues with Part V: Hextech Revolution.